"We want to hear Mr. Medvedchuk. We want him very much." 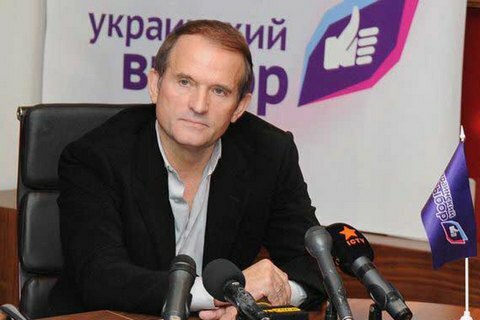 The Security Service of Ukraine summoned the leader of the public movement Ukrainian Choice, Viktor Medvedchuk, for questioning on charges of illegal crossing the border by Ukrainian officials in 2014-2015. "Of course, we want to hear Medvedchuk. We want him to call in," head of the SBU main investigation department, Hryhoriy Ostafiychuk, told reporters on Thursday after the interrogation as a witness of the leader of Justice movement, a former head of the SBU Valentyn Nalyvaychenko. "Of course, we want to hear Mr. Medvedchuk as well. I want to take this opportunity and invite him to call in," Ostafiychuk said as quoted by Interfax-Ukraine. He said that the SBU has summoned Medvedchuk for questioning in the case but never showed up. "We invite him to come and fulfil the procedural obligations," said the SBU official. Nalyvaychenko was summoned to testify as a witness in the case of illegal crossing of the border officials in 2014-2015.